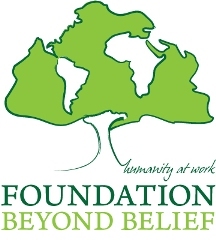 I am delighted to announce the launch of a new humanist-driven charity initiative, the Foundation Beyond Belief. Go to the site itself for full details, and to sign up. Though it is explicitly modelled on humanist values, religious individuals are explicitly invited to participate. Social networking will be a key part of the Foundation’s interaction with members – this is not just a conduit for money, but a place to build community around shared values and actions. Members can choose where their donations are spent, among ten categories (education, peace, health care, environment, and others). Charities will be selected not just on the values they profess, but on efficiency and effectiveness as well. Religious charities are not explicitly ruled out, but charities that use their funds for proselytizing are (regardless of the worldview they promote). Though based in the US, the Foundation explicitly looks to support charities with an international reach. Two of the key people involved in the Foundation – Dale McGowan and Hemant Mehta – were instrumental in my decision to become a blogger (though I have yet to meet either of them in person). Beginning on January 1, 2010, Foundation Beyond Belief will highlight ten charitable organizations per quarter — one in each of ten categories. Among other considerations, beneficiaries will be chosen for efficiency, effectiveness, moderate size (annual budget <$10M), compatibility with humanist focus on mutual care of this world and this life, no direct promotion or proselytizing of a particular worldview, and geographical diversity. Deena and I are big readers, and so part of our preparation for parenthood has been to get hold of some key parenting books. One which we have already read cover-to-cover, but whose practical relevance may not kick in for a couple of years, is Dale McGowan‘s collection of essays by various humanists, atheists, and others: Parenting Beyond Belief. Awesome book, by the way. Even before our kids are old enough to start trying some of the things mentioned in the book, it provides great reassurance for us as secular parents. For some reason, I didn’t really notice that he also has a blog sparked by the book. It was just before I started this blog that I found it, through his interview with my Friendly Role-Model, Hemant Mehta. And it’s great. The whole blog. I’ve read a good dozen or so of his blog posts now, and they’re brilliant. Funny, moving, informative. He does what I aspire to do – describe what it’s like to live as a humanist, compellingly and with mind-ticklingly lyrical wordcraft. It’s brilliant.